Barbara: Just throw [my clothes] anywhere... I won't be needing them till morning. Matt: Don't you think we should be introduced first? Matt: Good enough for me. While doing press for Austin Powers: International Man of Mystery, actor Mike Myers stated in quite a few interviews that his film was a mixture of many of the great swinging spy movies of the mid-1960s. Though the James Bond and Derek Flint influences were unmistakable, one such cinematic effort whose creative elements most certainly wormed its way into his affectionate homage has gone largely un-trumpeted. 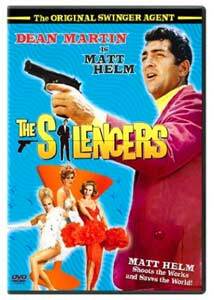 In 1966, Dean Martin starred as Matt Helm in The Silencers, the first of a series of spy movies based on writer Donald Hamilton's novels. Given the period and the performer, the grim and serious overtones of the tomes were given the heave-ho, making room for Dino's relaxed, patented swinging charm that he brought to his music (and his beloved television series, which commenced right around the time of this film). Much like the crooner that brings him to life, Helm is a man who lives to avoid responsibility at whatever means possible, mixing pleasure with more pleasure from the confines of his swank bachelor pad (complete with gadget-controlled circular bed), playing host to a seemingly endless line of beauties while dabbling in his photography hobby. Sound familiar, Austin aficionados? Thought it might. Wait till you see the getaway golf carts and a secret "underground lair"-ish hideaway. But let's not get ahead of ourselves. Eventually, Matt's old boss, MacDonald (James Gregory), lures him out of retirement for a return engagement for ICE (aka American Intelligence and Counter Response) to thwart off the evildoings of Tung-Tze (Victor Buono), a Blofield-Dr. Strangelove baddie who plans to leak radioactive matter into the U.S. by wreaking havoc with their atomic missile program. With de-lovely personal assistant Tina (Daliah Lavi) along for the ride, its off to Vegas to begin the battle against Tze's "Big O" masterminds. Yet, for all their abilities to dodge bullets and villains with slick aplomb, all it takes is one vacationing, accident prone redhead (Stella Stevens) to get Matt's game plans all wet, climaxing with fisticuffs and gunplay at a local nightclub, implicating her as a potential suspect. Though its ratio of effectiveness wavers on the consistency meter at times, The Silencers is a fun, fluffy piece of vintage espionage escapism thanks to Dino's effortless, alluring king-of-cool charm. Despite moments that lack punch (a lazily directed and edited car chase; an uninspired setup to the eventual showdown at the operations of Big O), Martin and a terrific supporting cast make the rough patches tolerable. Making the best impressions amongst the mixture of noted character actors (including Arthur O'Connell and Robert Webber) and requisite honeys (Lavi, Nancy Kovack, Beverly Adams) are James Gregory's gruff appeal as Helm's boss; the villainous specialties of Victor Buono (honed to perfection on TV's Batman and The Wild, Wild West in years to come); and Stella Stevens, one of Tinseltown's last classic glamour girls at her best as the klutzy, yet sexily endearing Gail Hendrix—the sequence where she gets a little too tipsy in Helm's high-tech station wagon and her woe-begotten escape attempt thereafter is a classic. Image Transfer Review: Most of the time, Columbia's '60s-era holdings are more than acceptable in the good looks department; Silencers' groovy spy movie color palette helps it fit snugly into this category. Although there are a few specks here and there (most notably during the opening credits and a composite shot in the first few minutes of the film), this is a really nice, sharp presentation with little to no aggravating anomalies to write home about; particularly nice in comparison to many a washed out print utilized for network and local showings over the years. In other words, we're talking "A-O.K." Audio Transfer Review: In the words of croondom's King "Leer", "ain't it a kick in the head." Robust, peppy two-channel Dolby mono really puts a spotlight on one of Elmer Bernstein's best scores; dialogue is razor sharp and the low end is extremely well pronounced. Only mild distortion from Foley effects like gunshots and tire squeals give away the fact that this film is an oldie (but a goodie). Very impressive. Extras Review: Like Dino might comment, we're not doing too good in the digital versatile grab bag, pallies. Though there's a trio of completely unrelated trailers (with the possible exception of former partner Jerry Lewis' Don't Raise The Bridge...), why Columbia continues to omit the feature's own coming attractions on most of its vintage offerings still irks. Also, on the back cover I found two spelling errors (in the second paragraph of the synopsis: "...to make the world a save place again..." and crediting Buono as "Bruno"). In addition to the attributes noted previously, add a winking title sequence that juxtaposes the typical opening of a 007 adventure with Gypsy Rose Lee-esque peek-a-boo playfulness, a song and dance cameo from musical legend Cyd Charisse, occasional warbling from Dino (plus Vikki Carr) and a jazzy cocktail of a score from Elmer Bernstein, consider The Silencers an instant addition on the DVD rack for those who enjoy '60s kitsch, spy movies, and, of course, the Dean Martin faithful.